Dragon Quest: Your Story an upcoming 3DCG theatrical anime film based on Square Enix's classic JRPG, Dragon Quest V : Hand of the Heavenly Bride . Kentarô Sakaguchi as Henry (known as "Harry" in English). And Takayuki Yamada as Papasu (known as "Pankraz" in English). Other cast members announced include Kendo Kobayashi, Ken Yasuda, Arata Furuta, Suzuki Matsuo, Kōichi Yamadera, Arata Iura, Chikako Kaku, and Kōtarō Yoshida. 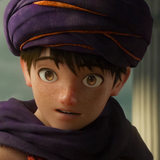 Dragon Quest: Your Story features general direction and a screenplay by Takashi Yamazaki, direction by Ryuichi Yagi and Makoto Hanafusa, music by Koichi Sugiyama, and distribution by Toho. The movie hits theaters in Japan on August 02, 2019.